I’m pretty sure everyone is very impressed by various camera phones in the market like the Nokia Lumia 1020, Sony Xperia Z1 and even the upcoming smartphone camera lens from Sony but it looks like LG is not going to lose out on the battle. 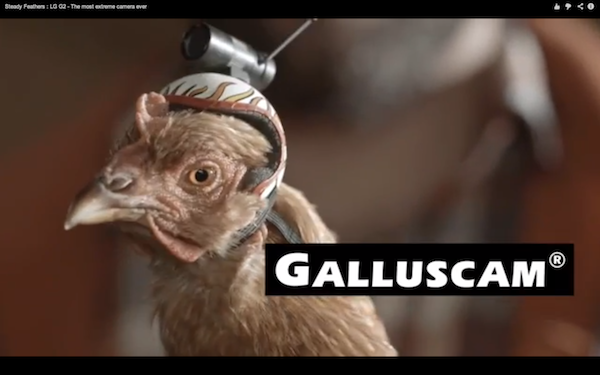 Last month, LG shared a video of a G2 flying to space and back, capturing its entire journey on its 13MP OIS camera to show off its stabilization, and now, LG is here again to brag on the OIS on the G2 using a chicken’s head as an example, yes, a chicken’s head. We won’t spoil it for you so catch the video right below. It looks like LG G2’s tag line “learning from you” is not only applicable for humans but hey, as long as it’s beneficial for us consumers, anything is welcomed. Anyone impressed with the LG G2’s camera or would you rather go for the more hyped up devices in the market – Samsung Galaxy S4 Zoom that features a 10x optical zoom, the 41MP Nokia Lumia 1020 and the 20.7MP Sony Xperia Z1 with G Lens on board?